Ethiopia has a strong claim to being the oldest country in the world. Written and pictorial records reveal aspect. Archaeology and paleontology bring the country’s history back millions of years. Ever since the American paleontologist Donald Johnson discovered the skeleton of old hominid female on 30 November 1974in a dried up Awash River bed at Hadar in the Afar triangle, Ethiopia has come in to the forefront of regions were mankind is believed to have first evolved. This famous young ape lady, whom Johnson called Lucy and gave the scientific Name Australopithecus Afarensis (Afar Ape-man), lived more than 3 million years ago. Ethiopian History has largely been determined by the country’s geography which reflects the working of dramatic geological forces, most of them still operative. Much new light has been shed on these process during the past quarter century. Study of the geology and history of Ethiopia is a continuous adventure in discovery. Geologically the Rift Valley is comparatively new feature of the earth’s surface. Intense volcanic activity raised highlands on both sides of the Rift valley and times spilled into the valley, leaving layers of deposits which help date fossil finds. In parts of the Rift volcanoes broke through the valley floor. In the region where Ethiopia, Eritrea and Djibouti meet some are active. Everywhere along the Rift (even at the bottom of the Red Sea) hot springs still bubble up from the depths, this evidence of continuing volcanism below. Though the Rift valley floors sinks 155m below sea level in the Danakil Depression along Ethiopia-Eritrea border, it rises in its mid-section to more than 1600m around the Lake Ziway, and then gradually slopes downward into southern Ethiopia and Kenya. The Ethiopian state originated in the Axumite (also Axumite) kingdom, a trading state that emerged around the first century A.D. Axum’s core area lay in the highlands of what are today northern Ethiopia and southern Eritrea. At the height of the kingdom’s power, Axumites controlled the Red Sea coast, from present day Sudan to Somalia and had dominion of land as far as the Nile Valley in the Sudan. On the Arabian side of the Red Sea, the Axumite kingdom controlled the coast and much of the interior of modern day Yemen. The Axumite perfected a written language (Geez), maintained relations with the Arabs in the Middle East, the Byzantine Empire (the Eastern half of the Roman Empire), and Egypt. There is evidence to suggest that the Axumite state arose as a result of interaction between migrants from Southwest Arabia, who arrived in the Ethiopian Highlands in the first Millennium B.C., and the peoples indigenous to the area. In the mid-fourth century, around 333 A.D., the Axumite king, Ezana, adopted the Christian religion. The Axumite kingdom left a legacy of centralized form of government and the central role of religion in society – two important elements that shaped Ethiopian history. The rise of Islam in the Arabian Peninsula, around 600 A.D., had a significant impact on the Axumite kingdom and ensuing kingdoms as well. The spread of Islam in the Mediterranean, the Middle East and Northern Africa and coastal parts of the Eastern Africa continuously isolated Axum culturally and commercially from the remainder of the Christian world – particularly the Byzantine Empire. In response to Islamic expansion around the Axumite kingdom and the subsequent loss of their maritime trade routes, the Axumites turned their attention to the northern Ethiopian highlands spreading the kingdom southward. By the tenth century, the Zagwe dynasty had emerged as a post-Axumite Christian Empire. The Zagwe kingdom was born out of the cultural and political interactions of the Cushitic and Semitic peoples in the northern highlands. Like the Axumite kingdom, the Zagwe dynasty was a political empire rooted in religion. The Zagwe devoted themselves to the construction of new churches and monasteries. Born out of this patronship of religious art is the construction of the rock-hewn churches of Lalibela. Ethiopian Christianity, however, was increasingly isolated from other Christian nations. With the conversion of Egypt to Islam, the Zagwe dynasty lost contact with its closest link with the outside Christianity, the Egyptian Coptic Christian Church. A new dynasty, claiming lineage from King Solomon of Israel and Queen Sheba of Ethiopia, came to power in the mid-thirteenth century. This new dynasty continued expansion and pursued a more aggressive policy towards the South. The kingdom found itself combating the growing influence of the Muslims closer to home in the coastal regions of Ethiopia. Religious and ethnic conflicts climaxed in the sixteenth century. The weakened Christian kingdom was pressured by Oromo insurgents in the South and by Muslims from the coast. The Muslim advance was turned back with Portuguese assistance. The contact with the Portuguese ended a long period of isolation from the rest of the Christian world. The Portuguese however brought their own religion, Roman Catholicism, with them and the Jesuit and kindred orders sought to convert the Ethiopians. Ethiopian leaders wanted the Portuguese as military allies only and resented their proselytizing. By 1632, after a civil war between adherents of Catholicism and Ethiopian Orthodox, the Catholic and Jesuit missionaries were expelled from Ethiopia and foreign interaction was again limited. Between the second half of the 18th Century and 1855, Ethiopia was a loosely organized nation without a strong, central ruler. This period is known as Zemene Mesafent or “The Era of Princes”. Throughout the country, there were regional kings who governed particular regions. Though there were nominal kings and at times an emperor, the real power lay in the hands of the noble princes who held the titles of “Ras”. The different principalities were connected economically but were politically disparate – very much resembling a conglomerate of federated states. By 1855, Ras Kassa Hailu of Kwara (later Emperor Tewodros II) emerged as the most powerful of the regional nobility. His military and political (with an emphasis on the former) prowess established his power in Kwara region and allowed him to successfully challenge the other nobility. He succeeded in defeating the other Mesafent and in so doing, became the sole Ethiopian ruler. This accomplishment is the basis of the modern Ethiopia. Although Ethiopia had been united under both the Axumite and Zagwe kingdoms, what set Tewodros II’s leadership apart is that the borders of Abyssinia (Ethiopia) were continuously expanding? Tewodros II, and the subsequent Ethiopian Emperors who followed, not only established a cohesive but were willing to expand by colonization. Ethiopia’s next two leaders, Emperor Yohannes IV and Menelik II, built upon Tewodros achievements. They continued to build the state and combat foreign (and especially Italian) colonial interests in Ethiopia. The decisive battle of Adwa in 1896, in which Ethiopian forces defeated the invading Italian army, is a moment of great pride for Ethiopians, and indeed all people of African origin. 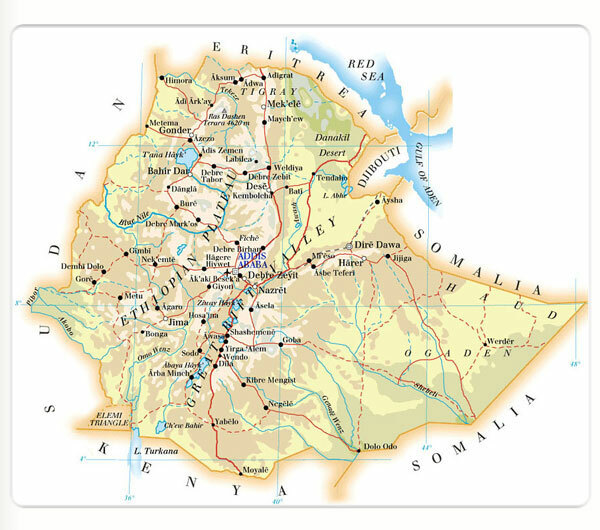 By the early 20th century, Ethiopia had reached its present size compromising the highlands, the key river systems, and the state's central core, surrounded by a borderland buffer zone in low-lying, arid or tropical zones. After a series of events characterized by short reigns, Ras Tafari Mekonen (later Emperor Haile Selassie) emerged as the leader of Ethiopia. Haile Selassie centralized the state and expanded Ethiopia's civil society as a counterweight to ethnic forces. He fostered unity through the development of a national army, a pan-Ethiopian economy and modern infrastructure and communications. The Emperor was also instrumental in garnering foreign aid while he was in exile in Britain during the late 1930's when Italy invaded and occupied Ethiopia during 1931-1936. Ethiopia's determination not to be colonized, coupled with the pressures of World War II on Italy, forced Italy out of Ethiopia once more. Haile Selassie continued to reinvigorate the state. However, the economic benefits were not reaching the peasantry and the working classes, and they eventually rebelled and overthrew Haile Selassie in 1974. And that ended the history of the Ethiopian Monarchy. This gave way to the government of President Mengistu Haile Mariam (1974-1991). The administration, rooted in Marxist-Leninist theory and politics, set to create a socialist motherland for the benefit of the masses. Although the intentions were noble, the entire system was foreign to Ethiopian society. Resettlement, villagization, mass political organizations and the command economy alienated the people from their natural environment, alliances and allegiances. More importantly, the de-emphasis of religion, in a country rooted in religion, further aggravated the society. Ruthless suppression of ideological adversaries fostered nationality movements. In 1991, the government (also called the DERGUE) was overthrown by rebel forces led by the Tigray People's Liberation Front (TPLF) and the Eritrean People's Liberation Front (EPLF).